The Hammer comes preloaded with an open source bootloader, Linux 2.6 kernel, and a uClibc/Busybox based root file system. Board schematics, application notes, and source code are also included on the CD. The Hammer Board is a 40 pin DIP modules that can run full standard GNU/Linux. The Hammer Kit comes with everything you will need to begin developing for the Hammer Board, and is strongly recommended for first time Hammer Board users. All development tools have been created for use with Linux, so you will need a working Linux system to use the Hammer Board and develop applications for it. Pinout with more explanations and links. 20 GND Ground - supply voltage return. 39 +3.3VDC Internal regulator output. Can supply 100mA(?) safely. Overloading this may cause irreparable damage. Hammer-RDP stands for Hammer Robotics Development Platform. This is a new carrier board for Hammer being developed by TinCanTools for the Robotics, Process Control, and the general interfacing and hobbiest market. The Hammer-RDP is ideal for tinkering with sensors, servos, and whatever else you might want to connect to Hammer, since it provides both 3.3V and 5V selectable pin sections. 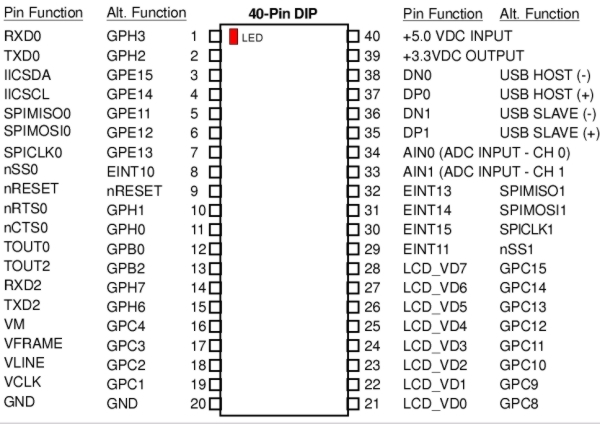 Please NOTE: You must jumper select each four pin section on Hammer-RDP for either 3.3V or 5V operation, and connecting a 5V device to a pin jumpered for 3.3V operation will most likely damage the Hammer Board. * Small size - just 3" x 3", ideal for space constrained applications. * Stackable add on boards can be created for custom applications such as process control, home automation, robotics, etc. * Three pin headers for all GPIO connections, allowing easy interfacing to sensors, servos, and other devices using this pin arrangement. * Jumperable dual voltage selection for all GPIO connections - 3.3V or 5V. Pins can be jumpered for either voltage in sets of four. * Dual voltage (3.3V and 5V) I2C bus. * Most Hammer signals, including I2C and USB, are available on the stacking connector. This page was last edited on 17 November 2008, at 13:24.